An engagement is a promise to marry, and also the period of time between proposal and marriage. During this period, a couple is said to be affianced, betrothed, engaged to be married, or simply engaged. Customs for engagement rings vary according to time, place, and culture. An engagement ring has historically been uncommon, and when such a gift was given, it was separate from the wedding ring.The tradition of giving a ring for marriage engagement originated from Judaism that was originally a golden nose ring given by Eliezer of Damascus to Rebecca. In the modern era, some women's wedding rings are made into two separate pieces. One part is given to her to wear as an engagement ring when she accepts the marriage proposal and the other during the wedding ceremony. When worn together, the two rings look like one piece of jewelry. Here are a few images to help you begin the process of selecting a ring. These are a mere sample of what is available and we invite you to visit or showroom to get a better idea of what is possible. Douly's Jewelry offers diamonds of every shape, size and quality. We take pride in specializing in and suggesting medium to higher quality diamonds, especially for the main stone in a ring. We'll show you how a little extra investment can lead to a much brighter and more stunning diamond. This maintains the long term value of your heart-driven investment and we always work within whatever budget you set. So, how do you start the process? Contact us to make a appointment to review the basics in the privacy of our showroom. We'll take you through the "Four C's" commonly referred to when examining a diamond. Seeing the actual diamond and understanding how each aspect fits together to affect your investment makes the true difference. 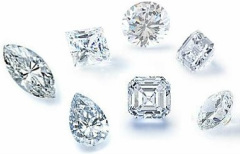 The best way to get educated about diamonds is to see the diamonds in person with a qualified and honest jeweler. We specialize in hands on demonstrations of loose diamonds. Our website provides a glimpse into our inventory. Please contact us for personalized help with your diamond quality and selection.